The only thing scarier than Halloween night is celebrating it without a spread of spooky foods. This recipe for ghostly pretzels is the perfect snack to lift your spirits—or raise them from the dead. Pour white chocolate chips and coconut oil into a microwave-safe glass bowl and heat in short 10-20 second bursts until melted. Quickly and carefully, use a fork to immerse and coat pretzels in the white chocolate mixture and transfer to your baking sheet. Remember to keep the bottom hole of each pretzel open for your spirits’ ghostly screams. Feel free to reheat chocolate once if it hardens during the process. Dab a little chocolate on the back of each candy eyeball and place it on the top portion of each pretzel. Allow your ghosts to harden completely before removing from the baking sheet and enjoying! 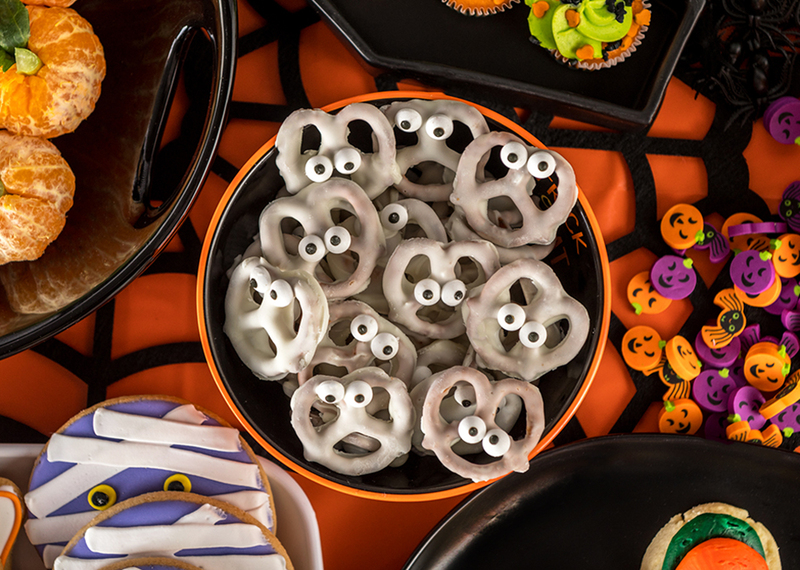 Get everything you need to make our Screaming Halloween Pretzels online or in store!